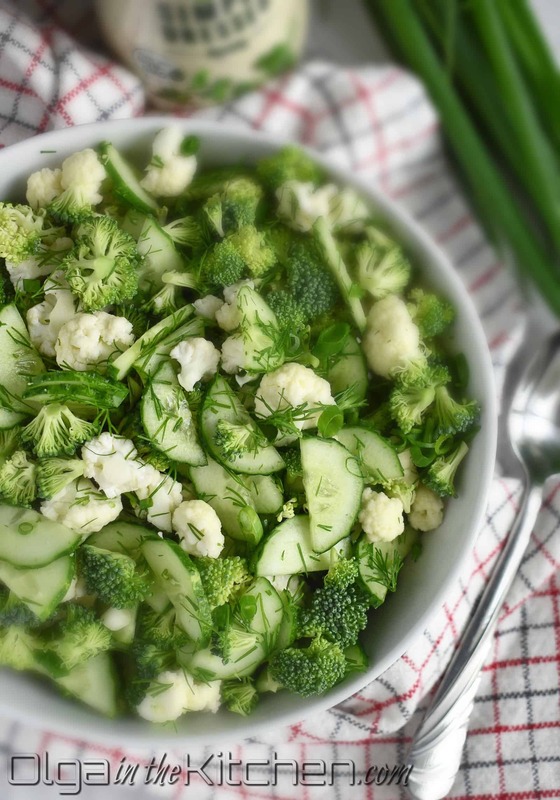 Broccoli Cauliflower Cucumber Salad also called Spring Salad (by me). It reminds me of spring when everything is blooming and it seems like the whole world is just green with all the bushes, flowers and trees. 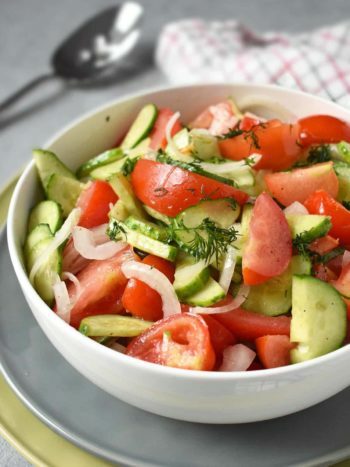 This salad is so easy to make, so simple and only 7 ingredients with dressing if you count the salt. You can make it ahead of time and dress just before you’re ready to serve it. 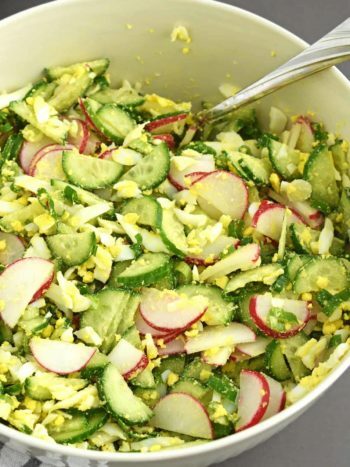 It saves nicely in the fridge for days and doesn’t create any off flavors like many salads do. The texture and the flavor of this salad work together so well. 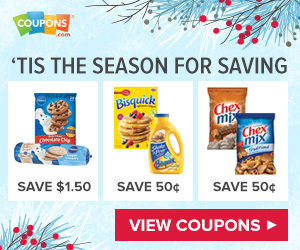 That crunch is just waiting to happen. In my little family, I’m the only one who eats this salad. My husband is not a big fan of broccoli and cauliflower and I’m not even going to say anything about kids. However, both of these ingredients are really healthy and good for your body. 1. Wash all vegetables & paper towel pat dry. Cut 2 medium broccoli heads into small florets and transfer to a large bowl. 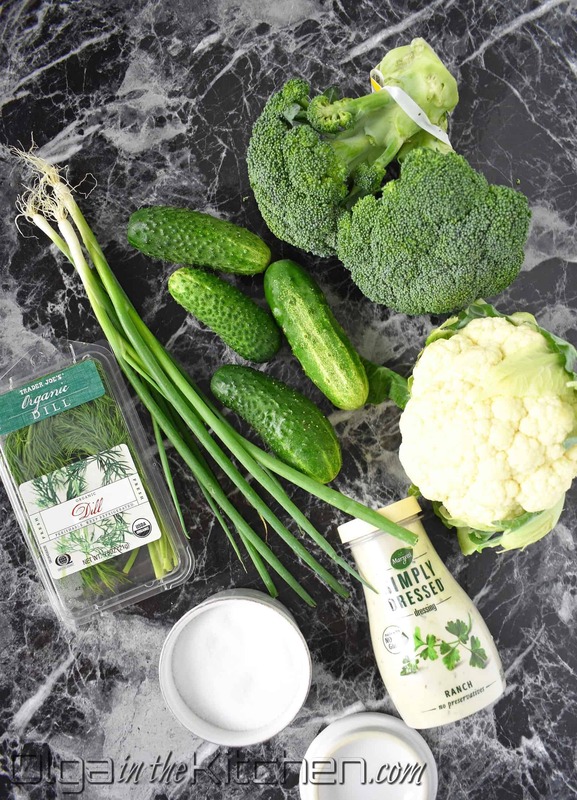 Cut 1 medium cauliflower head into small florets similar in size to broccoli and add to the bowl with broccoli. Dispose the cauliflower leaves. 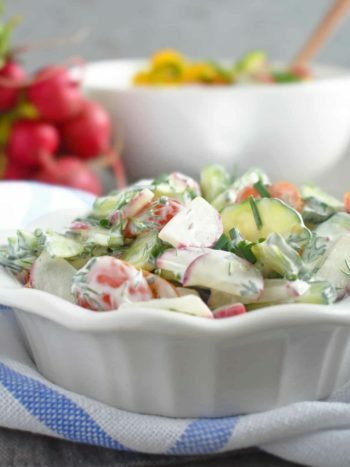 Cut 4 medium cucumbers into half and then slice onto a benriner mandolin into the bowl with salad. (make cucumber slices 2-3 mm in thickness). Finely chop 3 green onions and 1 pack dill. Stir the ingredients in the bowl with a tablespoon until mixed well. Add Marzetti Simply Dressed ranch or Litehouse brand and a pinch of salt or to taste to the salad before serving. Refrigerate dressing-free salad until ready to serve. Enjoy!! 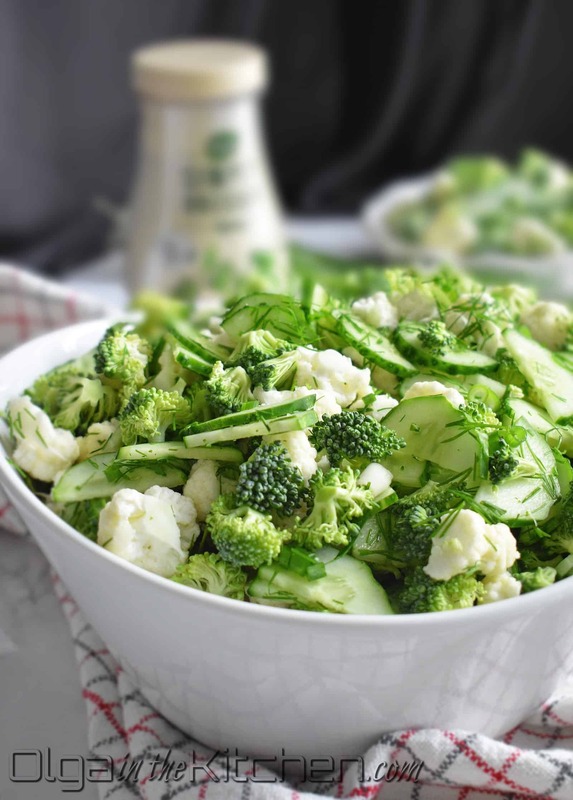 Broccoli Cauliflower Cucumber Salad: combo of green veggies bring out the delicious crunch dressed with favorite ranch dressing. Wash all vegetables & paper towel pat dry. Cut 2 medium broccoli heads into small florets and transfer to a large bowl. 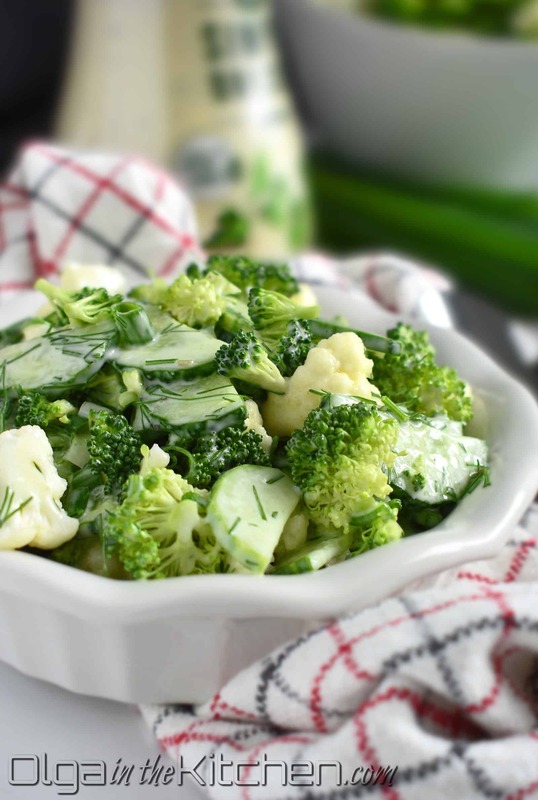 Cut 1 medium cauliflower head into small florets similar in size to broccoli and add to the bowl with broccoli. Dispose the cauliflower leaves. Cut 4 medium cucumbers into half and then slice onto a benriner mandolin into the bowl with salad. 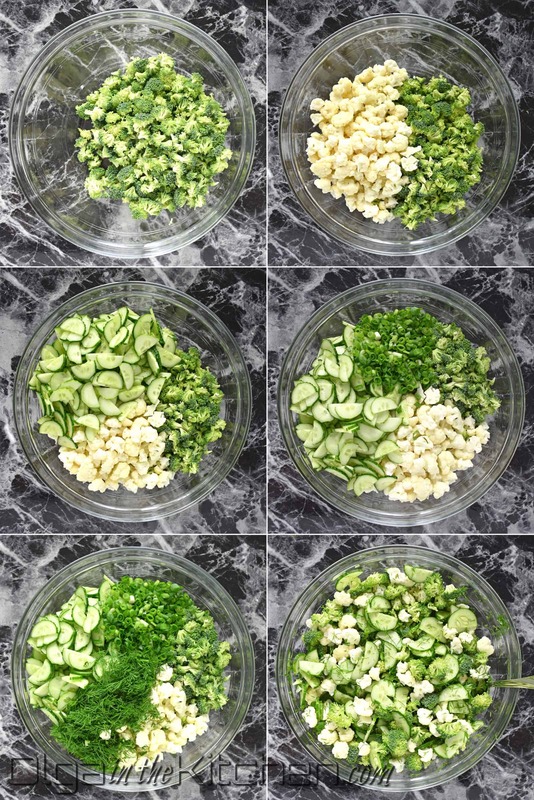 (make cucumber slices 2-3 mm in thickness). Finely chop 3 green onions and 1 pack dill. 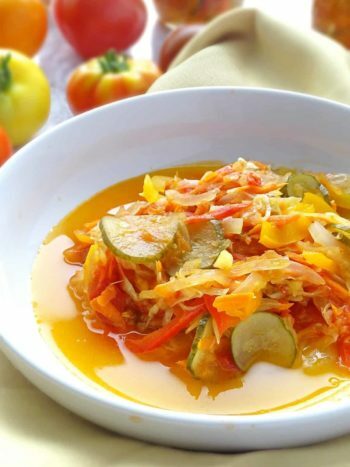 Stir the ingredients in the bowl with a tablespoon until mixed well. Add Marzetti Simply Dressed ranch or Litehouse brand and a pinch of salt or to taste to the salad before serving. Refrigerate dressing-free salad until ready to serve. Enjoy!! This salad is great! But, you must blanch the broccoli and cauliflower! Nikki, you can if you want to but in my family no one ever ate broccoli and cauliflower prepared that way. We tried it once and the salad went to waste because it was too mushy, had this interesting smell and everyone disliked that it was blanched. We like crunchy salads. They taste fresh and have that fresh aroma! I cut the broccoli and cauliflower into very small (maybe 1cm diameter) pieces and it works just great!? My family loved this salad. 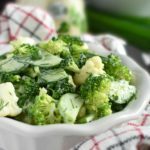 We love broccoli and in the past saw recipes where you have to cook the broccoli and cauliflower and no one liked it that way. It like gave some extra unappetizing aroma. Making it your way, it’s fresh, it’s crunchy and just heavenly. Thank you for such great recipe!